Crowdsourced connectivity provider Open Garden is launching its first app for the iPhone(s aapl), but it’s not the same broadband sharing app the startup has become known for on Android(s goog). Instead, Open Garden has created an iOS messaging app called FireChat that connects people to other iOS devices around them. While Open Garden’s Android app forms an ad hoc mesh network so nearby users can share their data connections, FireChat forms its network solely for the purpose of social communication. Instead of creating a network of friends, colleagues or shared interests, FireChat creates a constantly morphing community composed of other FireChat users in the vicinity – whether it’s in a subway car, at a sporting event, or in a coffee shop, said Micha Benoliel, Open Garden co-founder and CEO. While Open Garden certainly isn’t the first to build a location-specific social communications app — a long line of services goes all the way back to Foursquare — it is one of the first companies to take advantage of the multipeer connectivity framework that Apple introduced in iOS 7 as a social networking medium. The framework lets Apple devices form direct connections via Bluetooth and Wi-Fi without an internet connection acting as intermediary. 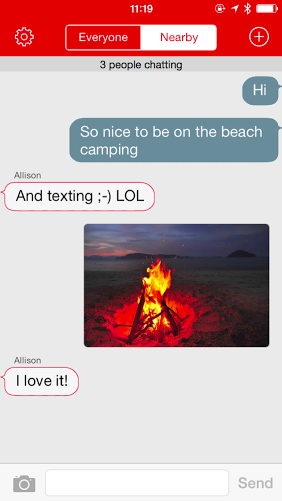 That means FireChat users can message one another even when there’s no cellular or Wi-Fi connection available. Open Garden has also built into FireChat the multi-hop connection technology its Android app uses to link long chains of devices together. The end result is that you won’t just be able to communicate with FireChat users in the same subway car, but also in the next or two cars over. As long as there is a FireChat-enabled device to act as a node in the chain, there’s really no geographic limit to how big the ad hoc network can be, Benoliel said. That said, it will take time before there is enough of an install base for users to form networks of any size. Benoliel is hoping FireChat will reach a critical mass quickly, but in the interim the app supports a mode called “Everyone,” which is kind of a global network of all FireChat users linked via the internet. As more users sign up, FireChat’s “nearby” mode will become useful. Of course, that all depends on how many people are actually willing to converse digitally with complete strangers who share only their immediate location in common. Benoliel believes there’s more demand for such a service than you might think: commuters could share their collective woe when stuck on a delayed train or bar patrons could digitally shout down a particularly ill-advised selection on the jukebox. There will be one thing that all FireChat users will have in common from the get-go. They’ll all own Apple devices. Surprised they didn’t write an android app too? The Serval Project was there first, with a lot more besides. Perhaps they and Open Garden should talk to one another? Mostly Europe, and their business Access Point device for purchase doesn’t exist yet. this brings up an interesting concept. in a dense urban area it may be possible to sell a hardware only device that once enough people own them would allow any one in the city to talk to anyone else without need of any centralized network. the hard part would be to very quickly gets a large portion of the population spread through out the city to buy the hardware. if the initial devices were very simple like perhaps text and voice only they would not need the large amount of bandwidth of devices duplicating smartphone/tablet functionality and they could be sold cheaply . if anything such a mesh network could wake people up that there are alternatives to paying monthly fees to network operators. @Frank, I think we are looking to complement the existing infrastructure. The P2P mesh tech approach provides the granularity we all need for ubiquitous Internet access. Every device becomes a router, an Internet node. This can’t be achieved by cell towers and wifi networks only. You are right that with enough density, not only connectivity will be better but also the opportunities to offload traffic to wifi or through the mesh will increase. I’m more interested in how it affects battery of the smartphone?